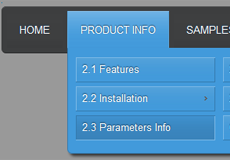 Wonder if you have any info for using css3menu 3.3 iweb. I created a very nice dropdown but not sure how to incorporate it into pages created in iweb. Hi I tried your horizontal drop down menu. but It didn't work .